A remarkable free video editor that makes even advanced editing straightforward, Shotcut is a brilliant tool for novice videographers. Shotcut proves that a top-notch video editor doesn't have to cost a fortune. It’s available for Windows, Mac and Linux, and is totally free with no ads, bundled adware, or features hidden behind a paywall. 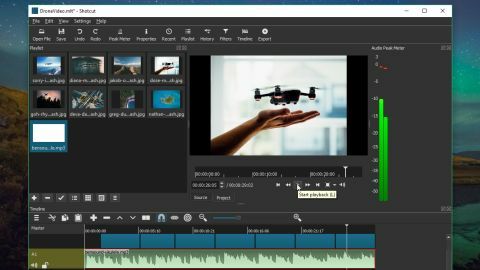 If you’re looking for a free video editor that can replace Windows Movie Maker, Shotcut is a particularly good choice. This open source app contains all the tools you know and love from Microsoft’s classic video editing software, plus a raft of extras that bring it up bang up to date. In just a few easy steps, you can use Shotcut cut your video footage to a specified length before converting it to a format of your choice. You can also edit your projects with a selection of filters and effects. Shotcut also includes a recording function lets you save and edit footage from your webcam, and it can handle streaming in HTTP, HLS, RTMP, RTSP, MMS and UDP formats. Shotcut’s standard interface is smart, but sparse. Don’t be put off, though; clicking the buttons along the top bar (peak meter, properties, playlist and so on) adds modules to the display so you can configure it to your liking. The process of importing video clips, audio and images is a familiar one. Just select your media files, then drag them to the timeline at the bottom of the screen. You can create multiple tracks for audio, video, and handy tools like snapping make it easy to join clips together neatly. Splitting clips is as easy as positioning the playhead, then clicking a button. Trimming clips is a piece of cake too, and there are copy and paste tools for chopping and changing sections. The history timeline makes it easy to track changes, and undo any by simply tapping the Delete key. Shotcut’s best feature, however, is its raft of video and audio filters, which are fully customizable and can be layered and combined in all sorts of interesting ways. Simply choose a filter and click the plus icon to apply it, then make adjustments using the simple system of checkboxes and sliders. It’s a brilliant system that makes even advanced effects simple to understand. There’s no way to preview a filter before applying it, but removing an undesirable effect is so simple that this isn’t much of a hardship. Overall, Shotcut is very hard to fault, and its huge array of export formats is the icing on the cake. It would be nice to have optimized profiles for specific devices, but that’s really nit-picking. Shotcut is a remarkable video editor. Give it a try – there’s nothing to lose. Watch our top 5 free video editors below!